Eddie Giacomin, a fan favorite over his six seasons between the pipes in Providence, was a 1987 inductee into the NHL Hockey Hall of Fame. 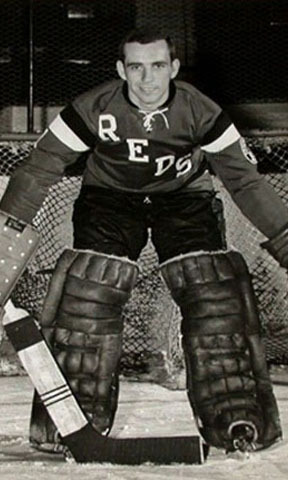 Over the span of his playing days with the Reds, Ed complied a 109-129-10 record with 12 shutouts, from 1959 through 1965. A talented all-around athlete, Eddie turned down athletic scholarships to play college football and baseball in California to pursue his hockey passion. Thanks to his fiery nature and wandering style, he would eventually become one of the most popular and successful players ever to wear a New York Rangers jersey. Eddie became a 5-time NHL All-Star. In Giacomin’s 13-year NHL career, from 1965 through 1978, this acrobatic goaltender recorded 54 shutouts while compiled a sparkling 2.82 GAA and a 289-209-96 record in 609 games. He also shared NHL’s Vezina Trophy as the league’s best goaltender in 1970.